The gold looked very fair and pure, and Frodo thought how rich and beautiful was its colour, how perfect was its roundness. It was an admirable thing and altogether precious. When Sauron's body was destroyed in the drowning of Númenor, 'he was robbed now of that shape in which he had wrought so great an evil, so that he could never again appear fair to the eyes of Men' (S 280-81). We can see something similar in Morgoth after his duel with Fingolfin: 'Morgoth went ever halt of one foot after that day, and the pain of his wounds could not be healed; and in his face was the scar that Thorondor made' (S 154). What's intriguing here is that both Morgoth and Sauron have transferred much of their native power out of themselves as a means to exercise dominion, the one into the substance of the world itself, the other into the Ring (Morgoth 399-401). For Sauron at least this transfer seems permanent, since the 'strength and will' (S 287) he had put into the Ring did not return to him when the Ring was destroyed. Now one might object that while Tolkien seems to have some knowledge of the properties of gold, his knowledge might not go very far. I have heard it said that throwing the Ring into a volcano wouldn't have melted the Ring any more than a hearth would. From what I can see, however, this is not so at all times. Lava can range from 700 to 1,200 ℃ (1,300 to 2,200 ℉), and the melting point of gold is 1,064 ℃ (1,948 ℉). Magma can be even hotter, up to 1,600 ℃ (2,912 ℉). Given that the Sammath Naur is inside Mt Doom, we might well surmise that we are talking about the upper end of the temperature range. Another objection would be that the Ring changes size and weight. Bilbo wrote to Frodo and told him as much (FR 1.ii.47): 'it did not seem always of the same size or weight; it shrank or expanded in an odd way, and might suddenly slip off a finger where it had been tight.’ Frodo's experience is somewhat different. When Bombadil returns the Ring to him (FR 1.vii.133), '[i]t was the same Ring, or looked the same and weighed the same: for that Ring had always seemed to Frodo to weigh strangely heavy in the hand.' In Moria, 'at whiles it seemed a heavy weight' (FR 2.iv.312). Note here the uncertainty introduced by 'seem' in each case, and contrast it with the following statement in Book 4: 'In fact with every step towards the gates of Mordor Frodo felt the Ring on its chain about his neck grow more burdensome. He was now beginning to feel it as an actual weight dragging him earthwards' (TT 4.ii.630, italics mine). This suggests the subjectivity of the perception of the Ring's weight. We may also compare the experience of Sam. He feels the 'weight' of the Ring the instant he puts it on (TT 4.x.733; RK 6.i.898). But, when he picks up Frodo on Mt Doom, 'to his amazement he felt the burden light. 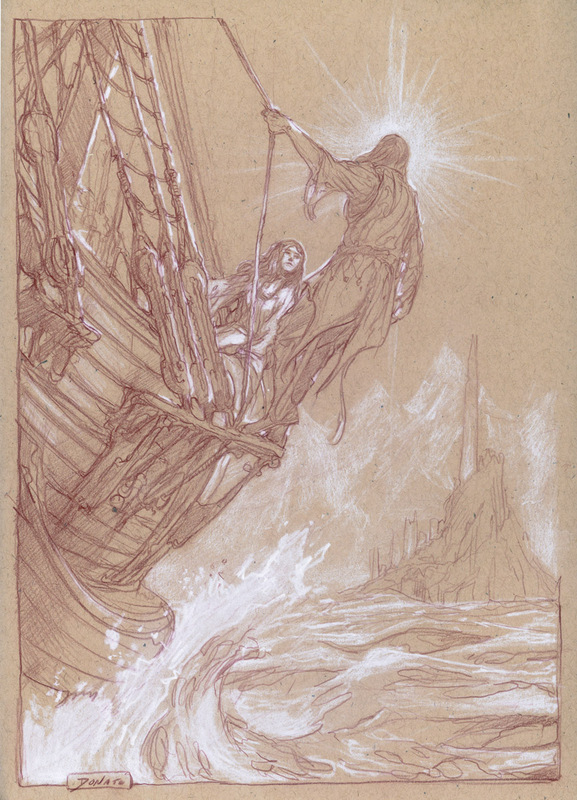 He had feared that he would have barely strength to lift his master alone, and beyond that he had expected to share in the dreadful dragging weight of the accursed Ring. But it was not so' (RK 6.iii.941). At the very least examination of these passages calls into question the notion that the actual weight (or size for that matter) of the Ring changes. What seems far more likely is that the Ringbearer's perception changes. 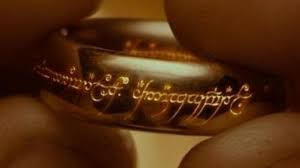 Be that as it may, the One Ring is also a magic ring, imbued with vast power drawn from within himself by a being of angelic stature in his origins. Whatever the exact properties of the gold in the Ring, the infusion of Sauron's 'strength and will' changed it as much as it changed him. But is it not passing strange that this transfer seems to have left Sauron bereft of the ability to regenerate (to borrow a phrase) into a fair form while at the same time conferring a perfect beauty upon the Ring? If this is correct, if Tolkien actually meant this connection, we may see Sauron paying a terrible price for the power to dominate all others: all that remained in him that was fair and fine. The rest was darkness. Frodo's use of the word "precious" recalls Gollum's Ring-talk, to suggest how the Ring is drawing Frodo into Gollum's fate. The uncertainty of the bearer's perception must start from the beginning, from the first apprehension of its appearance. Which brings us to the questions of why (or even how) mere mortals such as Gollum, or Frodo can even be drawn to a sign of "angelic stature," as you say, which transcends their capacity of comprehension. Shouldn't they simply be oblivious to it, just as Sam is to Galadriel's ring, or as everyone seems to be, to Gandalf's? Thanks for that, Troels. I think anyone would be drawn to a sign of 'angelic stature', whether they could comprehend it or not, whether they consciously perceived it or not. That much power is like a gravity well. I also found myself thinking throughout this post the words of St Paul that the devil can appear as an angel of light.